The elation I feel when a new poet begins speaking in this ancient and ever-new conversation -- and this new poet is truly ingenious, and furthermore, has learned to bring weight to bear upon each and every word, line, stanza, indeed, the gestalt of an entire poem -- such an experience is a homecoming for me. I feel again the excitement I first felt when the first poem of my existence spoke to me. Michelle Lewis is that important. 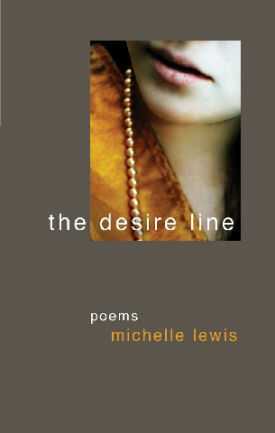 Her imaginative capacity, her acutely-observed psychological states, her encoded passion, her clear vision of exactly how her aesthetic commitments must play themselves out in each poem, her sense of integrity that makes each poem cohere, are a few of the qualities I see in the poems in The Desire Line. I am simply dazzled by this work, and, truth be told, envious. peered one dusty shaft of light.